Docking etiquette to keep your fellow yachtsman happy : Atlantic Yacht & Ship, Inc.
Once you are on the water you are part of the boating community. Therefore, it is always nice to follow the Golden Rule: “Do unto others as you would have them do unto you”. When you have to share a bollard with a neighboring yacht or boat, docking etiquette is key. Imagine cruising into the marina and you are the last one in. Do you toss your line over the bollard and head in to wash up? Of course not! When it’s time to head out, your neighbors will not be too happy. An easy and fast technique known as “dipping the eye,” allows each boat to leave without disrupting the other dock lines. 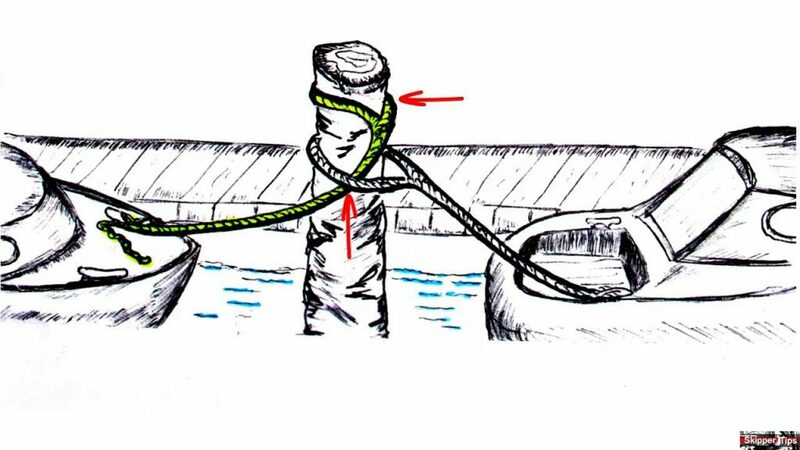 After tying the dock line to your boat, bring the end of the line with the eye on to the dock for placement. Loosen the eye of the neighboring boat so that you can thread the eye of your line through the bottom. This is shown in the image. Place your docking line with the eye over the top of the bollard and bring it above and parallel to the other line. Don’t forget to tighten! Happy Thanksgiving from Atlantic Yacht & Ship! Safe and happy boating wishes for the 4th of July from yacht brokers at AYS!